I started a new job about a year and a half ago, after a seven year haitus staying home and raising my kids. The most stress my feet saw during that seven years would be an hour in a pair of tennis shoes for my daily walk, or a pair of sandals or flip-flops for my general running around. But then I started working and I was on my feet all day every day for a high-paced retail environment, and my feet just weren’t used to that at all. I have to wear casual dressy shoes at work, which usually means some nice flats, and the first thing I noticed was how badly my feet would start to sweat. experienced it in the past. Of course, I always had a desk job prior to staying home to raise my kids, and I could kick my shoes off under my desk for a while at work so it wasn’t that big of a deal then. Now I had uncomfortable shoes on my feet all the time, and they simply don’t breathe. a long day at work. I tried some odor-eating insoles, because the sweat inevitably lead to odor, and even these didn’t work, though I tried a couple different kinds. I finally found a spray that I liked, that was odorless which was a plus, but even that wouldn’t last ALL day. 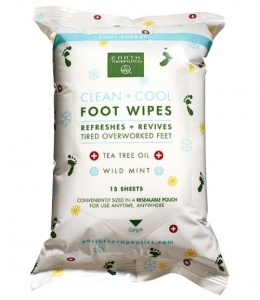 I found the Earth Therapeutics clean and cool foot wipes, and since they were only about $7 for a pack I wanted to try them out. They came in a nice pack that was easy to reseal. and wipes with me to work every day, and using them in conjunction with one another has been like a miracle cure for my problems. I haven’t come home from work since beginning to use these two things together with smelly or sweaty feet at all. considering they are so affordable and go a long way. I only use one wipe on each foot mid work day and that’s all I need. They have tea tree and mint extracts in them, and you can really feel that cooling and tingling sensation of the tea tree oil. If I thought it would help me after a long day at work, I’d wipe these all over my body, because they work wonders on my feet! I love them and wont be without them. I can do without them during a half day at work, but a full eight hours calls for their attention and they work like a charm every single time, and have a really pleasant smell to go along with them. Very nice and I highly recommend. Earth Therapeutics Tea Tree Oil Purifying Foot Wash.